Liriodendron tulipifera, yellow poplar, or tulip poplar tree, turning yellow in autumn. Poplar is one of the first hardwoods to lose its leaves. The tulip poplar is one of the first trees to turn its fall color of yellow and lose its leaves with early autumnal wind. We must learn to recognize it before it takes on its winter appearance. Standing prominently, and prolifically, as one of the straightest trees in the forest, one can spot the tulip poplar trees (Liriodendron tulipifera) if looking for the grey, straight lines in the woods with deep furrows in the bark at the base and lightly textured bark above. Distinctive poplar leaves look like little T-shirts, and the spring blossoms resemble yellow and orange tulips—hence the name, tulip poplar. Low-reaching branches of tulip poplars offer a delightful surprise of delicious nectar-manna awaiting the forager. After the blooms fade in early summer, sharp, little gun-shaped remnants of the flowers litter the ground. When I was a child, I used the tiny spears to poke other kids. Tulip poplars, or yellow poplars as they are also known, are ubiquitous in Southern woods and grow rather quickly, thus it a fairly sustainable tree to use. 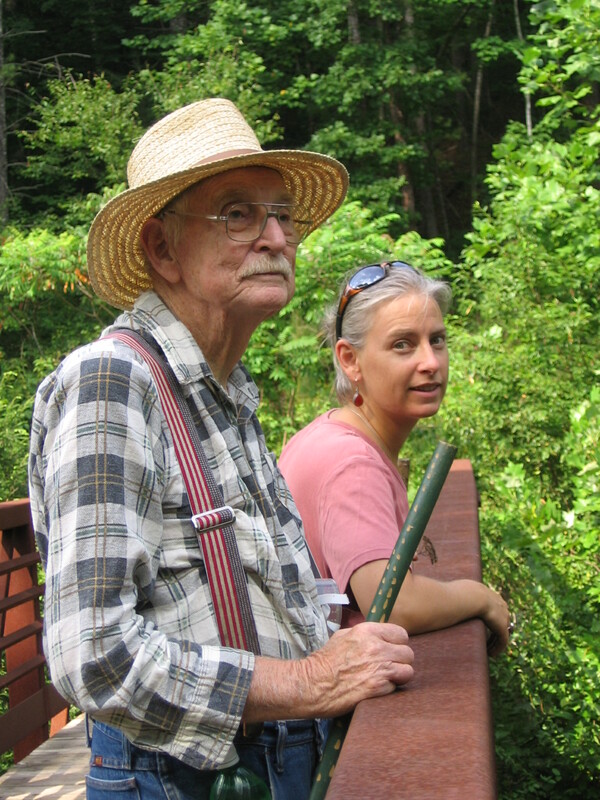 Jesse, native of Rabun County, GA, and maker of berry buckets out of yellow poplar bark sells his buckets in North Georgia and North Carolina, with artist Honor Woodard, painter, photographer, and author: http://silvermoonfrog.blogspot.com. Both are standing at the West Fork of the Chattooga River. Its bark is popular for the craft of berry buckets, a skill still practiced among Appalachian old-timers, like Jesse of Rabun County, GA. Jesse sells his poplar berry buckets at Highlands, NC festivals. Medicinally, tulip poplar is a remedy for arthritis, rheumatism, and intermittent fevers associated with malaria. In the 19th century, poplar bark was used as an alternative to expensive, imported cinchona bark, source of quinine for malarial fevers. 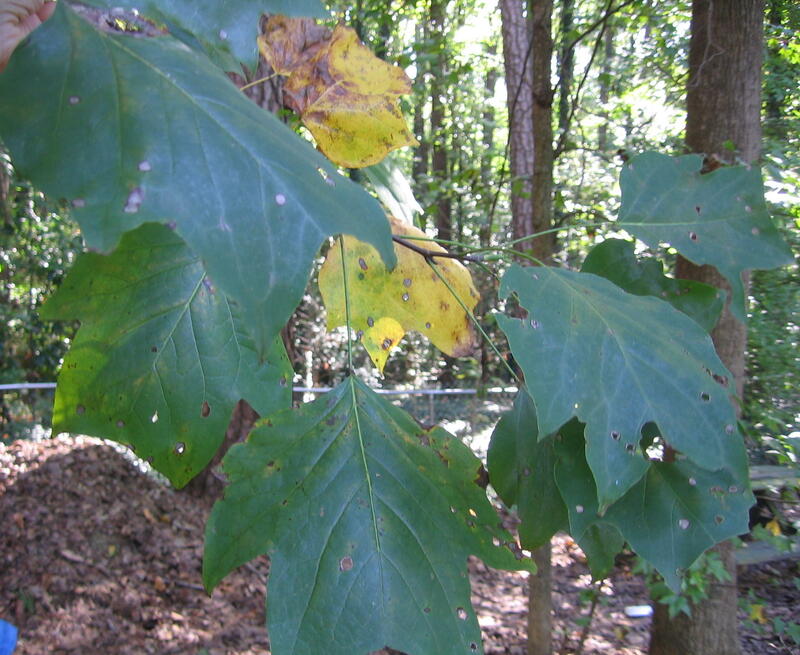 A recent study at Rutgers published in the Journal of Ethnobotany supports the historical use of tulip poplar leaves and bark as an antimalarial remedy. A tea from tulip poplar inner bark can offer some relief from joint inflammation found in arthritis and rheumatism, as will most trees of the Magnolia family. The tea is also beneficial for stimulating appetite and proper digestion in illnesses which lower a person’s desire to eat. American Indians also used the bark as a cough syrup. Bitter-tasting tea from the leaves, twigs and inner bark is also considered an aphrodisiac due to a combined calming and stimulating effect on the nerves. Flower buds from the tulip poplar have been used by American Indians as a soothing salve for burns. Squirrels love to eat the buds of tulip poplars, which might indicate the buds’ strong nutritional value. Tulip poplar wood is used for lumber and canoes. In the virgin woods of Cooper Creek Scenic Area of North Georgia, the poplar can grow to a spectacular circumference of 18 or more feet. When poplars are four feet in radius or more, they have a hard, yellow heartwood, lending the wood to applications where it must tolerate weather, as has been used in old, cabin building. In the Highlands, NC area, poplar bark is used as exterior shingles. A berry bucket made from poplar bark by Jesse. Poplar is great kindling to start fires with because it burns very fast and is entertaining when it snaps, crackles and pops. Poplar wood doesn’t form coals, though, so you need to add oak or pine if you want sustain the fire. 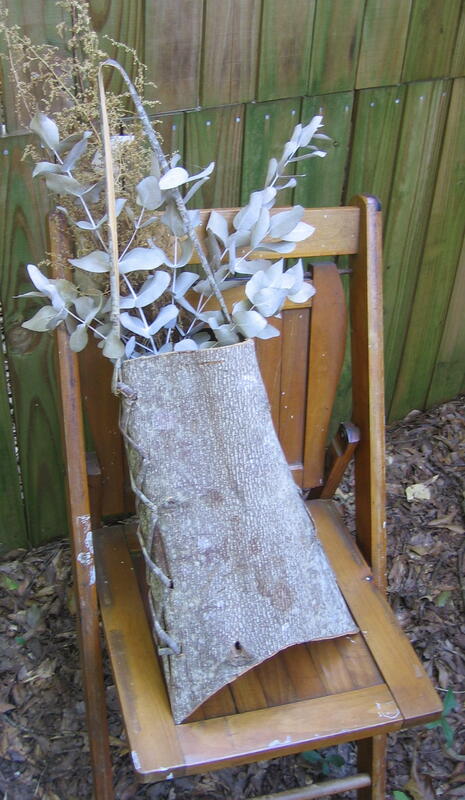 This article originally appeared in the Urban Forager of Athens Banner-Herald, October 10, 2010. Satolah, Rabun County, GA. 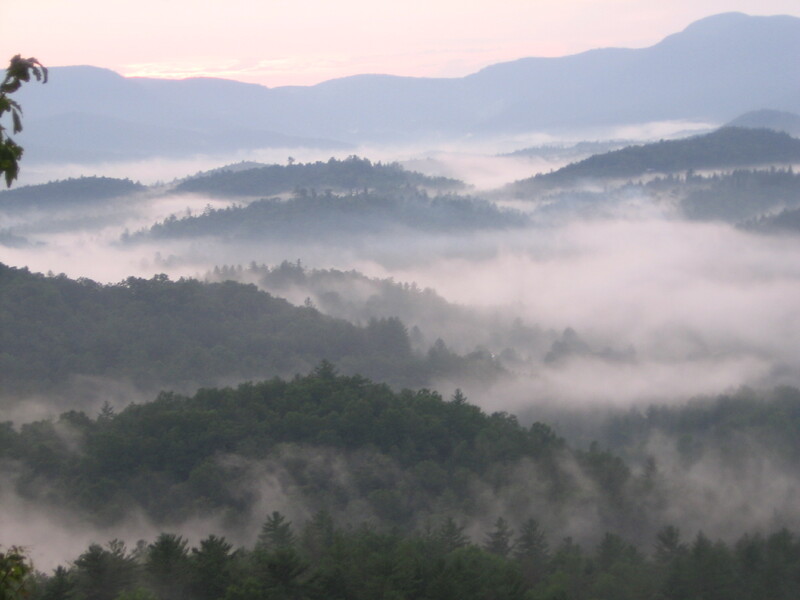 The view from Jesse's property.